Put your face on a bobblehead. 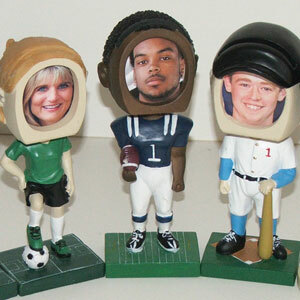 This fun novelty includes up to 10 different bobblehead styles to choose from. We shoot your picture and you go home with a unique keepsake. School must provide two volunteers, a covered workspace (indoor/tent/canopy), a table, a chair, bottled water, and access to a power outlet. If nearby parking can be arranged that would be appreciated as well. Want to talk with us about Photo Bobbleheads?